Examined broadly, Apple Computer's new Core 2 Duo-based MacBook Pro notebooks are strikingly similar to their predecessors, though more careful inspection has turned up a number of notable tweaks and enhancements. Introduced last week in 15-inch and 17-inch configurations, the new professional Apple notebooks utilize Intel Corp.'s new Core 2 Duo (Merom) dual-core processors with 4MB of Level2 cache compared to the Core Duo (Yonah) chips used in the previous version, which featured 2MB of Level2 cache. The larger L2 cache means that the transistor count in the Core 2 Duo MacBook Pro has been expanded from 151 million to 291 million. This allows for an increase in cache-to-processor data transfers, maximizing main memory-to-processor bandwidth and reducing latency. Additionally, Merom sports a slightly deeper pipeline than Yonah (increased from 12 to 14 stages), which also helps to increase clock speeds. However, just like the Yonah-based MacBook Pros, the chips inside the new Merom models are soldered to the main logic board. Compared to the Yonah MacBook Pro at 31 watts, the new Merom models sport a slightly higher Thermal Design Point (TDP) of 34 watts. However, the increase is not significant when viewed against the increase in performance. Thus, the new MacBook Pro can be seen as more power efficient than its predecessor. Aside from computational enhancements brought on by the Core 2 Duo, Apple has made several alterations to the design of its professional notebook line, both externally and under the hood. For starters, the new MacBook Pro ships with hard drives the come with a metal disk attached to their top cover to dampen hard drive noise. The disk is not removable, meaning replacement drives will need to be ordered directly from Apple until a third-party solution is developed and deployed. Located just above the hard drive is a newly designed Apple AirPort Extreme wireless card, which utilizes a color-coded three-wire antenna solution. True to rumors, the card identifies itself as an Atheros AR5008 with an 802.11n chip-set supporting the draft 802.11n wireless protocol. The MacBook Pro's Bluetooth implementation continues to be handled by a separate component card, which in the new systems has been relocated from the bottom case near the hard drive to a position underneath the top case. Meanwhile, a significant design change has been made to the notebook's right audio speaker module, making it a single piece of hardware. 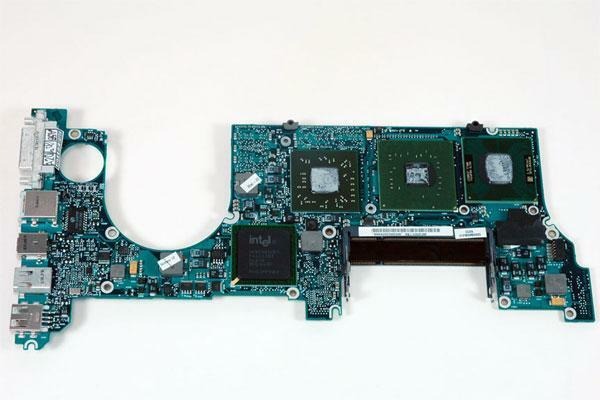 In the previous version of the MacBook Pro, the speaker housing was mounted below the main logic board and the right speaker driver was mounted through the board into the housing with its wire running over the top of the board. With the new single piece design, the entire right speaker is installed first and the logic board placed on top of it. 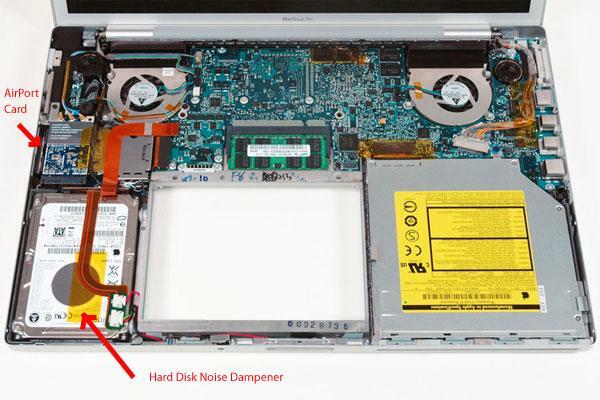 This means the entire logic board must be removed to access speaker. Additionally, the wires for the speaker are now routed below the logic board, under the heat sink and along the back of the system. While some operations have become slightly more challenging within the new MacBook Pro, Apple has taken measures to simplify others by utilizing the same JST wire bundle connectors used in the 13-inch MacBook. The connectors are easily plugged and unplugged like a power cord. Although new MacBook Pro can easily be mistaken for its predecessor, the inclusion of a FireWire 800 port on the logic board of the new model makes its bottom case incompatible with previous MacBook Pro models. Similarly, internal revisions prevent the keyboard from the new 15-inch model from being used for repairs to the previous model because the caps lock key will fail to function properly. Both 15-inch MacBook Pro models, as well as the new 17-inch model, are shipping out of China pre-loaded with Mac OS X 10.4.8 build 8N1037, BootROM version 00A5.00, SMC firmware version 1.12f5 and infrared firmware version 110 software. They also include Trackpad v13 and Camera v184. The new MacBook Pro does not contain any internal user-installable parts with the exception of memory. Although the notebooks will accept up to a 2 GB SO-DIMM in each of its two memory slots, the system will only recognize 3 GB of total memory. For external shots of new MacBook Pro, please check out an earlier report published on Tuesday.